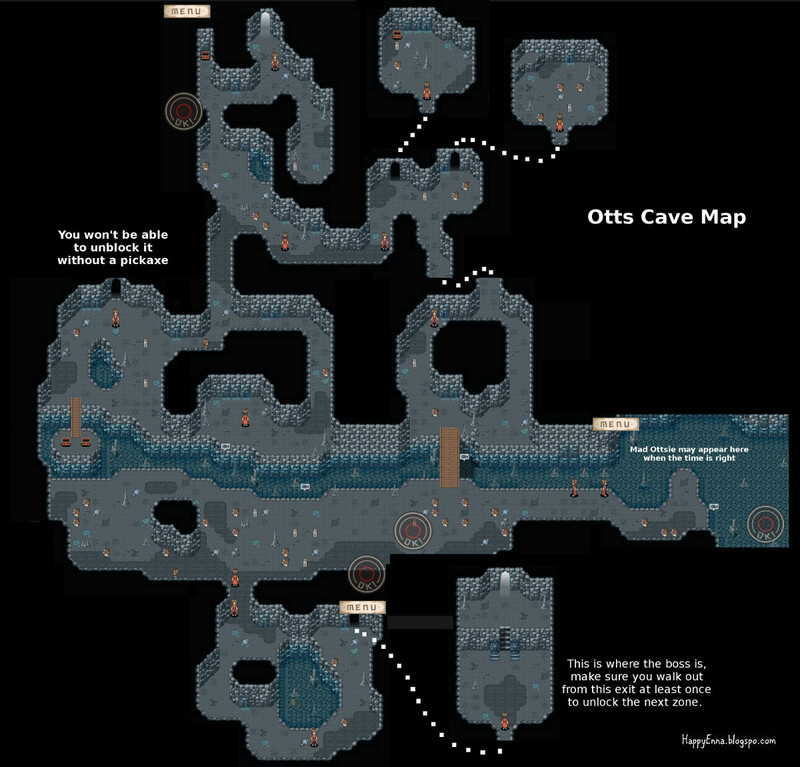 So I did it, there you go, a map for Otts Cave. Hopefully you can find your way out there. Remember wherever you go, this applies to other dungeons too, make sure you walk out of the exit near the boss at least once. The first time I went to Otts Cave, I was being "smart" and decided to walk all the way back to the entrance so I could farm more ingredients. What I didn't know was that it was the key to unlock Silkreef by walking out of the exit in Otts Cave. Please click the image to see the map in its original size. there are nos secrets here right??? There's only the cave that you need to dig into with a pickaxe. how to get the pickaxe? Ena wer to find dragon tung? And whats unside tha cave? Mount Gilbert, Mount Trulus, and The the area "???" have dragons that drop dragon tung. Inside this cave, you can find the second boss of the map, Shadow. How to unlock the otts cave? Just keep bringing your bar's rank up, and talk to people. It should be unlocked for you soon. How to get pickexe. ??? Can u giv me some tips about wat is a good lvl for my members siela,fred and alter(lvl50 rite now) to b.
I'm afraid I'm not very good in this particular area. It's weak against light and fire element, so if you want to kill it faster, then picking equipment or spells with those stats would be good. When I am in battle, I usually try and keep everyone's health up as much as possible. Sometimes it looks like a waste but I just use a few turns to get everyone's health up if it's needed. There are some equipment that may give some resistance to dark magic, or avoid being KOed. Maybe those can help too. It's also a good idea to bring a few holy water with you. So if your healer dies, at least you can get her up again. If it's still too difficult, it really doesn't hurt to eat more food and let the day go pass. Instead of leveling everyone, I usually give Siela the first priority to have the best exp food. When someone is stronger than others in the party, at least that particular person can survive to save the day. Also I'm not sure how to play Alter. I think he is a tank and he is supposed to stand in the front and others at the back. I want to ask you, I've already finish the story and kill ottsieottsie in the Otts Lake. but, the Mad Ottsie isn't at the Otts Cave. did I miss something?